This is 1 of 2 posts today! To find out the March Giveaway Winners CLICK HERE. Hello there lovelies! 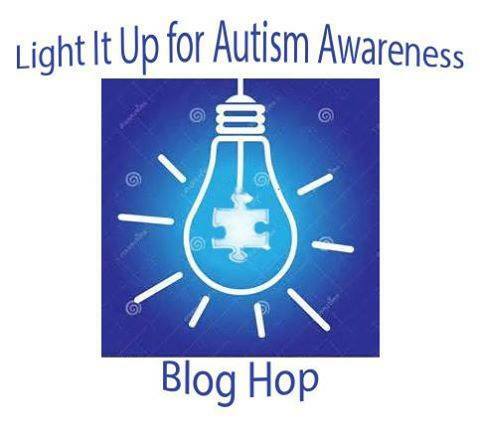 Welcome to the Light It Up Blue For Autism Awareness Blog Hop hosted by Tenia Nelson and Veronica Zalis! So many fantastic sponsors and crafters have shown their support for Autism Awareness. Check out the complete list HERE. If you would like a chance to win a prize from one of these fabulous companies (including w&w!) leave a comment on this blog, and any of the other blogs participating in today's hop! Winners will be chosen at random and will be announced on Monday April 6. I (Shay) decided to try my hand at making something bright and blue to participate in this wonderful blog hop. I cut the tag from white cardstock using Essentials: Katharine Cutaways and also cut the strip of dots from the tag using the same Essentials: Katharine Cutaways. I cut out the "thanks" from The Big, the Bold and You Cutaways twice from marine glitter paper by American Crafts and once from navy cardstock. I adhered the glitter thanks together and then added the navy layer slightly offsetting it for a shadowed look. 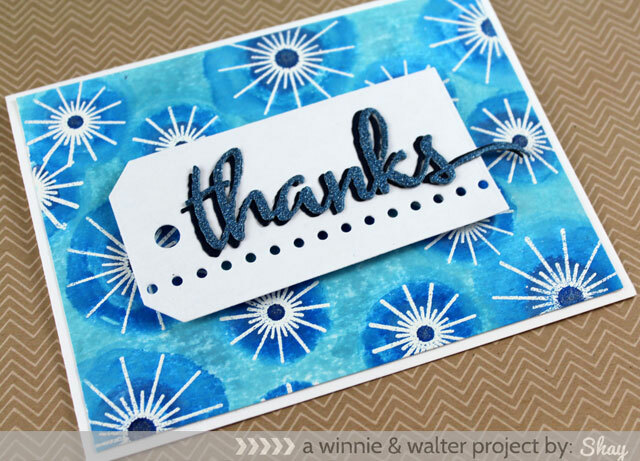 I added the thanks to the tag and adhered the tag to the card using dimensional foam adhesive. I hope you have a delightful time hopping along for such a worthy cause! LOVE your card Shay - your background is STUNNING (I REALLY NEED that stamp) and your SPARKLING thanks really POPS with the navy shadow - LOVE IT ALL!!! THANK YOU for sharing your CREATIVE INSPIRATION and THANK YOU for being part of this Blog Hop for such a wonderful cause!!! This is beautiful! And I have the supplies to make my own version of it! Yeah! Your background is stunning; a perfect canvas for the oh-so-pretty tag! Isn't being part of this hop marvelous...such a fabulous cause! The card pops like a fire cracker. So bright and bold. Beautiful. Great card for a worthwhile cause. what a gorgeous background, I love how that turned out. Wonderful card and thanks for sponsoring this amazing hop! LOVE this card! your background is STUNNING!!!! 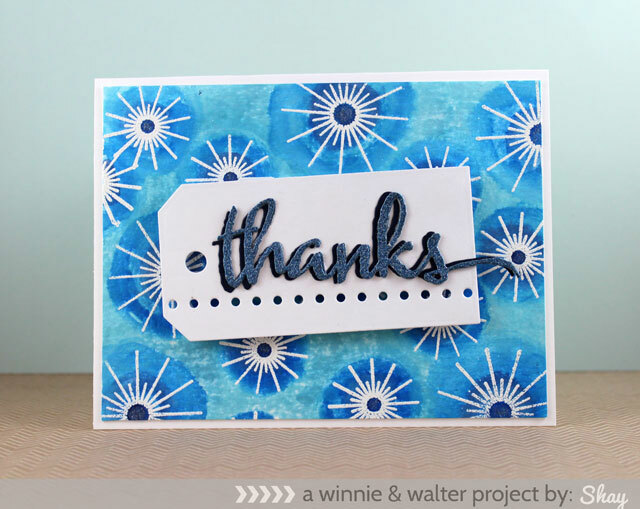 Beautiful blues and a wonderful card for this hop! Oh my!!! That background is ROCK STAR!!! Love it! Thanks for such a fun hop for such an important cause!!! Great background. Anything in shades of blue hit's my joy button! I love that background you created and of course I always love to see the bold words. Fab background and card! Thanks W&W for sponsoring the autism awareness hop! Love that background - what a beautiful card! Such a pretty card! Love the background! Such a lovely card! Looking forward to seeing the whole stamp set. Especially liking the bright blue colors Shay used! This is so beautiful. I'm loving that background you created. What a great emboss resist card...beautiful. Such an awesome card, Shay! I love your pretty card! Bright and cheerful! Awesome blue background and very beautiful card!!! WOW - your card is most definitely, certainly, totally bright and BLUEtiful!! Awesomely done and such a gorgeous background!! Love it and thank you for sharing it!! Thanks so much for participating and supporting this hop!! I hope you have a REALLY GREAT day!!! Fabulous background! Love the blue gradient, and love the new sparkle! Now this is one GORGEOUS card. Love all that "bluetiful" sparkle on this card. Simply amazing. Thanks for a chance to win and your support for this awesome hop. Your background is absolutely gorgeous! Stunning card! Wow. What a gorgeous blue background created for such a wonderful cause! Also love the shadow effect you created on the word die cut! Fabulous background on this gorgeous card! Thanks do much for sponsoring this hop and helping to raise awareness of our autistic kids. They have brought me joy for the many, many years I have worked with so many on the spectrum. I love your card! Fabulous background! 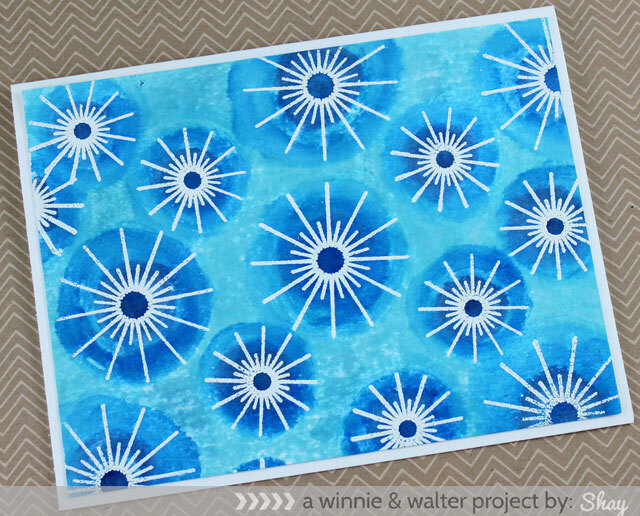 Love the lovely blue background you made with the sparkle stamps! Can't wait to see the May release! Love how you created this background. This card is super gorgeous! I have two children with autism. Thanks for supporting this cause. What an awesome background you made! So nice that your are supporting such a worthy cause. Love your pretty blue card! Awesome for the Light It Up Blue hop! Beautiful card. I love the background, it is amazing. Thanks for being apart of the hop and Thank you to Winnie and Walter for sponsoring and supporting the hop too. What a bright and cheery card and a great cause to support!! Amazing card, Shay - the blues are stunning! Oh I love this and have this stamp and this gives me another wonderful idea!! How inspiring! What a delightful card and you have also made a wonderful background! This is a great way to raise awareness about autism. Awesome such a nice way to raise awareness for autism. Love, love taht background clever way to make it, awesome card. Gorgeous card, love your background. Thanks so much for participating in the Autism Awareness blog hop. I love this! The bright white pops are gorgeous on the blues! Beautiful tag, on a great background !! I'm thankful for the organisation of this warm blog hop; and for you all, to participate and share your creations ! What a SPECTACULAR background with such an amazing graphic feel. THANK YOU for being such a class act company and sponsoring this hop! Yes, I love making my own backgrounds especially with the emboss resist technique! I love your bluesy card! I am loVin your background. thanks for sharing your wonderful card. I totally LOVE making my own backgrounds and leaving the sentiment panel simple. Love this pretty card in blues. Thanks so much for sponsoring this important hop!!! Your bold card is just perfect and I love the background! Thank you for sponsoring this blog hop - it's much appreciated! What a gorgeous background and fabulous card! Thank you for being a sponsor to this amazing blog hop! Such a cool design! Love the bg for that fab tag!